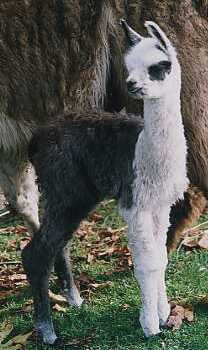 This handsome boy is Sarah’s third cria. He weighed thirty pounds when he was born and is covered with thick grey soft fibre with white on his front legs, face and chest. At a week old he was very independent, often a couple of fields away from mom, until he was hungry. 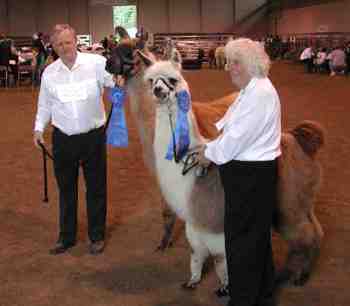 On May 18, 2002 Chinchero and his father, Viscount, both won first place for their age groups in the Walking Fleece Class at the West Coast Llama and Alpaca Breeders’ Show in Langley, British Columbia. For more information on Chinchero or any of our other animals drop us an e-mail.